I first got my BodyBugg on June 11, 2010 and I literally took it with me wherever I went. You wear it on the back of your non dominant arm so that is the left for me. 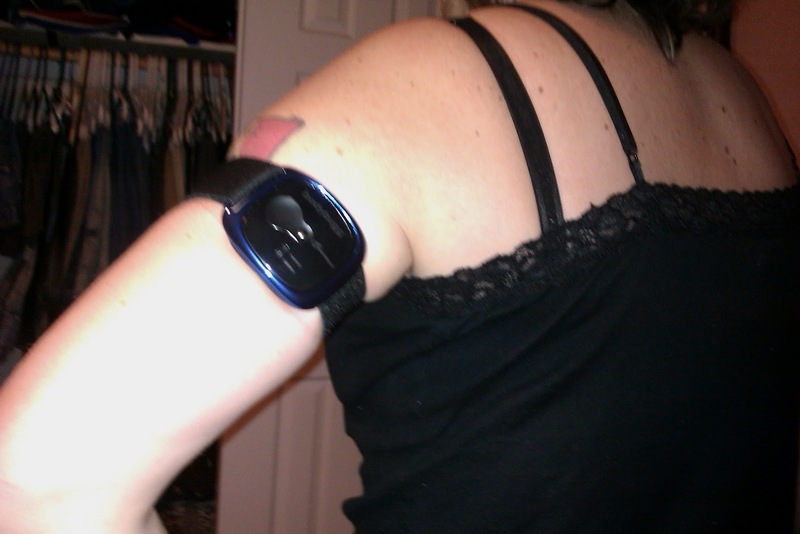 It has sensors on the back that track your heart rate, temperature of your skin, and steps. You wear it 24/7 except for in water. 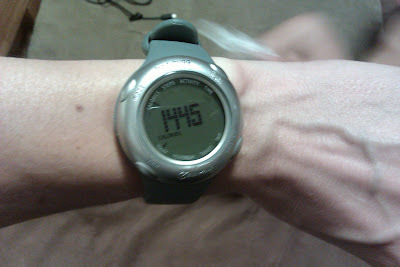 I wore it while I was training to run my first half marathon and then continued as I lost weight. I reached a weight that I was happy with in 2012 and I took it off. I didn't want to pay a monthly service fee and I felt like I was in a good place. It has a digital display that I wear on my left wrist that tells me exactly how many calories I am burning a minute, how many steps I've taken, and how many minutes of activity. My goals now are to burn 2495 calories, walk 10,000 steps, and do one hour of moderate activity. My body's metabolism burns approximately 1.1 calories per minute when I am resting. So if I just lie in bed all day long, I'm going to naturally burn 1584 calories. In order to lose a pound a week, I need to burn 500 more calories a day than I consume. I can either watch my calories very carefully and eat 1000 calories which is not considered safe, or exercise and eat moderately. I love my food so I prefer to count the calories and consume around 1500-1700 calories a day so I have at least a 500 calorie deficit each day. I found my Bodybugg and display while I was cleaning and unpacking a month ago but they were oth dead and I couldn't find a USB charger for the BodyBugg now that all our electronics take the mini USB now. I had to order a cable off Amazon and then remember to take the watch to the jewelers to get the battery replaced for $12. They don't manufacture the Bodybugg any more. It now retails for $159 and I really can't afford to spend that kind of money right now. Thankfully I was able to sync it with the BodyMedia website and activate a new monthly subscription for $6.95/mo. This device requires the use of a monthly subscription because you have to download the data once it reaches capacity. The interface is much easier to use than five years ago. I have gotten lazy about my fitness since we returned from Mexico and it's time to change that. I have been trying half assed since January 1st and I got nowhere besides losing the same 3 pounds over and over again. I like to share my journey on social media be it my blog or Facebook or Instagram because it helps to hold me accountable. My goal is to lose one pound a week until we move to Spain. I want to look great in our travel pictures and I want to be fit enough to traipse all over Europe with my backpack and my family. I hope you'll follow along and I'll be posting weekly updates as to my progress. In my next post, I'll bare it all with some before pics so we can see where I'm starting from and how far I can get in the next 15 weeks! I'm currently around 177 pounds so that means I need to reach at least 152 pounds before our flight out. It really is necessary because I can't fit into my jeans and I refuse to spend my precious travel money on a new wardrobe. Wish me luck!